If you are going to run a successful business, you must know how to sell. In the offline world, you need to have good salesmanship or leverage on a team of trained sales people if you want to see money rolling into your companys bank book. Fortunately online, even if dont have those qualities, but as long as you know how to sell in print, you can rake up an INFINITE amount of sales letters that act as your 24/7 online salesperson. In this video, you will learn the required skills you need to write high converting sales copy. You will also be shown free and low-cost tools that can get the job done. There are a few important questions that you must answer and begin to brainstorm before you write your sales letter/ Knowing who you are selling to, who your prospects are, how they think, what makes them take action... these are crucial factors to copy success because this way you know the problems they face, and the solutions they want, which theyll buy. Thats exactly what youll learn in this video. Youll also learn how to address your prospects in your sales letters and how to make your sales letter be exciting to read. Words sell. But the way you format and present your sales letter can dramatically affect your conversion rates. Who wants to read a sales letter that isnt readable or doesnt create an exciting environment? In this video, youll learn how to create a compelling layout, how to use certain type of fonts to make your sales letter easily read, the ideal width of letter, and the coloring. So heres the big debate: Long letter vs. short letter... which one converts better? Some say its the long sales letter and some say short sales letter Whatever your preference, it all boils down tests and conversions. Which actually converts better from people who have done tests? Weve taken the expert case studies of actual sales letters to show you why a certain sales letter type will help you not only convert well, but have future backend conversions. Youll also learn how to use links correctly on your sales page. The sales letter writing has been split up into three parts, for videos 5, 6, and 7. In this video, youll learn about the top area, which is the first thing your prospect will see. There are different types of headlines, and youll learn how to combine several of them to create an attractive and exciting headlines that hits on your prospects true needs and wants! The sub headline helps add to the headline, and youll learn how to do just that. How should you address your prospect and start the introduction of your sales letter? Often, the introduction is the hard part, because you dont know how to start off with a bang. This video will show you methods that expert copywriters use to jump start your sales letter. Now, weve gotten into the middle area of your sales letter Its time to announce the solution to your prospects problems, which is your product or service. But then your customers will begin to ask questions such as, How does your product or service Benefit me?. Youll learn the importance of using all these three items, and how to go about actually listing your benefits and some of the most common benefits that will strike your prospects wants and needs. Most of these items are located at the bottom of your sales letter with exception of some testimonials and proofs. The nice things about these items are they help increase your conversion rates of your sales letter Think about it. If you came to a sales letter and there were many true testimonials on the page with people that were saying good things about a product and they had the same needs as you... wouldnt you become interested? Of course you would. You will learn how to use these items and apply them to your own sales copy so that you can increase your conversions. What better way than to take what you learned above, and actually go to real life sales letters to begin to understand how they all piece together? Did you know that by doing this to other sales letters, you will eventually start writing better sales copy? You will be able to take your previous Online Copywriting Pro sales copy training and put it into action; which will stick in your mind forever. of all, you can get lots of tracking reports that will reveal your true sales copy conversions. You will learn how to correctly use this tool and apply it to your sales copy. Its Like Looking Over The Shoulders Of An Expert Top Gun Copywriter At Work! Forget E-Books that just show you theories or what it might be like. When you learn to write your first money-raking copy, I will be walking you through the steps - leaving no stones un-turned. And finally get them to take action on your offer! 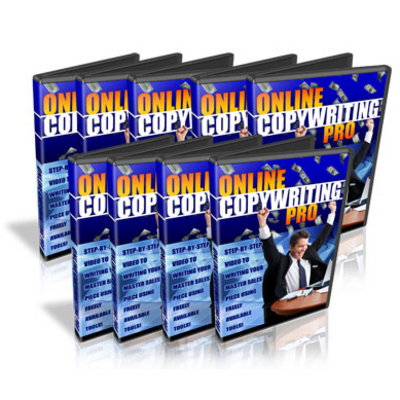 Ultimate Copywriting Secrets Pack + 2 Mystery Bonuses!